For most narrators, land is not only their prime asset, it is an integral part of their lives and identity. Many speak of it as though it is human, like a family member that has nurtured them for generations. As one says of the fields he has inherited, "These fields ... truly they are able to bring up the grandchildren and great-grandchildren of their owners" (Lesotho 20). The prospect of being separated from their land is traumatic. One narrator, in his 70s, likens the act of forcing them out of the area, and thereby separating them from their fields, to butchering and killing them. Another laments: "They . [are] taking our lives away from us. 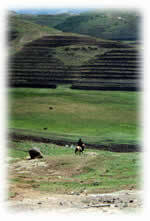 Fields are our lives" (Lesotho 7). The fact that leaving the area will also mean abandoning their ancestors, who are buried in the hills, further demonstrates how relocation will involve breaking a powerful bond between people - both living and dead - and their environment. The emotional way in which residents refer to the land is partly a reflection of the fact that the testimonies were gathered when relocation was imminent. The prospect of finding themselves unable to farm when they are resettled fills narrators with sorrow and anxiety: "I will remain thinking about ploughing, because when I am in another place there will be nowhere where I will plough" (Lesotho 13). Even if people do find land in the lowlands, they will need to buy inputs such as fertiliser and pesticide, which have been unnecessary in Molika-liko. Their deep attachment to land tends to obscure another reality, that landlessness has gradually been becoming a problem as the population has increased. Men in their 40s who have fields received them as inheritance from their parents, whereas couples in their 20s and 30s have been finding it more and more difficult to get land to cultivate. Sharecropping, whereby younger men cultivate fields of older or widowed women or economically weak male-headed households, gives those without fields of their own some access to land - but is not a long-term solution to the problem of landlessness. "[My memories will be] firstly, my father's big field down the valley which was a source of food for the whole family throughout my childhood. All my brothers and sisters knew we all survived because of that field. This is to say, we grew up feeding on that field." "Here where I have built is a place where I have lived well.... I was ploughing, I was eating and getting full in the stomach. I was planting each and every single crop in the fields. I was getting wild vegetables that have been created by God on the ground and I was being full in my stomach. Each and every single crop I was planting in my fields, and I was living comfortably in this land where we are being removed from today.... It will remain as a rock on my heart when I think of the place that I am being removed from." "I will not be able to plough my own fields because the population has increased and the only way is to sharecrop because even those people have difficulty in ploughing their fields. The population has increased but the land has not increased."